Yesterday, I made a trip to Vadodara. First halt was at Hotel Surya Palace where I was there especially to visit the hotel management school being run by a very dear friend and his wife. This Hotel School is affiliated to a university in Switzerland. I cam across some beautiful premises well executed, a practical kitchen, learned faculty and a very good bunch of smart and enthusiastic students. I spoke to the students and the faculty, wished them well, complimented the management and came out impressed. The second halt was at a factory to make frozen food , mainly for exports belonging to the same group. I was amazed to this state of the art factory being run by this 27 year old lad with such a vision and clarity. We had to remove all our accessories before entering the production area and we were covered from head to toe with protective clothing’s including a mask. It was the same scene inside with all the employees as if we were in a pharmaceutical company. This standard was as good as any other premium factory in a developed country or to match HACCAP or ISO standards. Food was being made by Chefs and then it was packaged and blast frozen in a very scientific and methodical way. Post that I shared my lunch with the owner and a colleague of mine in the factory itself, most efficiently served. The only speciality about the lunch was that it was made 5 months ago and everything was tasting fresh and tasty. Then we had a photo session with all the staff. From here also I came out very happy and impressed. Things are actually happening in towns other than metros. Already late by 2 hours I proceeded to my next destination Ahmedabad. Here, I was to finalise a place for my restaurant brand ‘The Yellow Chilli’s‘ next outlet. Post doing that, by midnight I was back to my Karam bhoomi – Mumbai. Flying out to Delhi late tonight. Tomorrow at 11 am I will be at Hotel Surya Crown Plaza in Friends Colony for a live cookery demonstration for the members of Swar Manjari Club. It is a wonderful platform to demonstrate the Ballarini cookware, tools and appliances as also to promote the opportunity that Wonderchef presents to women to create a business of their own. What I enjoy the most is the interactive session with the audience where I can really connect with all…this is the actual moment of feeling the pulse of the audience and then taking your food related queries and suggestions further, mostly using Khana Khazana show as the takeoff point. In the evening I will be at Noida to shoot infomercials for Wonderchef venture with Home Shop 18. I am looking forward to it as it involves cooking of many of my favourite recipes in these beautiful and state of the art cookware from Ballarini and Pavoni of Italy. Hectic but interesting. Shall keep you posted. Delhi, here I come !! It was great yesterday, with a lot of time spent with my idol Chef Satish Arora of TajSats. Chef Arora is an institution and has been a reference point for me throughout my career. I had been under the impression that chefs are rash, brash with lots of ego till I met up with Chef Satish Arora many many, years ago. He is a complete contrast: a picture of humility and modesty. We can learn a lot from him especially duplicate the passion he still feels for his standing with the Taj group (completing 43 years). He was gracious enough to take out time from his busy schedule and have a personalised workshop with all of us at KKIPL. He is a guiding light for the budding chefs and I am sure all of us gained many insights from his talk. He was accompanied by Chef Sanjay Kak who spoke about positive attitude being half the battle won! Chef Kak also shared how a winning attitude is created when one is convinced about oneself. 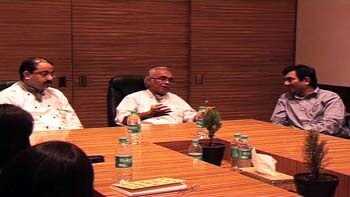 He has also advised that one should never write off anything, just change the way one handles the situation. We had a nice quick lunch together and then they left. Memories are made of these. Sharing experiences, good and bad, are the true teachers in life. Back from Hyderabad. I had gone there to formally launch the new book Wrap n Roll at Landmark. As the place started to get crowded and noisy, hopped over to The Yellow Chilli (ten minutes walking distance!) for all the interviews. Hyderabad holds much delight for both Alyona and I. We had a late and lazy breakfast at Chutneys (the steamed dosa is a no oil version and really super) and by the time we left it was nearly one o’ clock. Same evening went for dinner to Paradise Restaurant which is loved for its biryanis. In fact, they give excellently packed take away. Hyderabad airport is jazzed up. As our flight was a little late we reviewed all the fast food outlets and do they serve in style! The gelatos go the fastest as also the cookies from Karachi bakery. I could not help but notice the stress on brown bread at these joints. I have always been of the opinion that Indians have been eating brown bread for centuries…think of the roti/chapatti/rotli…isn’t it brown bread? Wholewheat flour product baked on a griddle instead of the oven? Our everyday food is atte ki roti and not maide ki roti. Think about it. We have had the blessings of whole food since centuries and then the sliced, soft white bread comes along and then decades later the ‘brown bread’. There is no way of confirming that the ‘brown bread’ we have bought is really made of wholewheat or is it really refined flour with caramel colour. 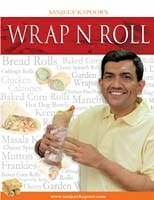 My new book Wrap n Roll makes excellent use of rotis to make quick meals and snacks for those on the move. I think it is high time we switched from sliced breads to rotis and let this campaign begin tomorrow itself when you have to make your kid’s tiffin. Have to go now. Till I write again. There is something cooking in our kitchens at all possible times and these days we are thoroughly enjoying the trials for the new book in the making. This new book is for the appeasement of fussy kids and we hope it proves to be a big relief for harried mums! We have had very good response from you with loads of good photos…making the choice will be tough! But do keep sending as the book is still in the infancy stage. This month is the beginning of the festive season. Rakshabandhan is just two days away and I hope all of you enjoy the day to the hilt. Cook delicious meals, give and receive a lot of gifts and generally have some memorable family moments. This Thursday I will be at The Yellow Chilli at Hyderabad. I am giving the address here in case you still haven’t tried out the food there! The Yellow Chilli, R S Square Hotels and Resorts Pvt. Ltd., E 3 & 4, 4th Floor, Kimtee Square, Road No 12, Banjara Hills, Hyderabad – 500034.